As Boston Marathon Bomber Admits Guilt, FBI Sued for Killing Friend of Tsarnaevs in Florida | Democracy Now! director of the Technology for Liberty project at the ACLU of Massachusetts. She has been closely following the Tsarnaev trial. The trial for accused Boston Marathon bomber Dzhokhar Tsarnaev has opened in Massachusetts after defense attorneys failed in their repeated bids to move it out of state. Tsarnaev, and his brother Tamerlan, who died in a shootout with police, are accused of planting bombs at the marathon finish line, killing three people and injuring 264 others. On the trial’s first day, defense attorneys acknowledged their client’s role in the bombings, but said he was heavily influenced by his older brother. The trial comes as the Council on American-Islamic Relations in Florida has announced it will sue the FBI for $30 million on behalf of the family of an unarmed Chechen man killed during questioning over his ties to the Tsarnaev brothers. The FBI says an agent shot Ibragim Todashev in self-defense after Todashev attacked him, but his parents have accused the FBI of killing their son “in cold blood.” We speak to Kade Crockford, director of the Technology for Liberty project at the ACLU of Massachusetts. 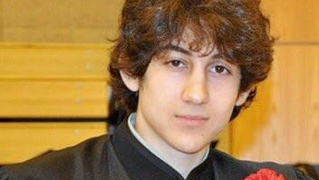 JUAN GONZÁLEZ: The trial for accused Boston Marathon bomber Dzhokhar Tsarnaev has opened in Massachusetts after defense attorneys failed in their repeated bids to move it out of state. Tsarnaev and his brother Tamerlan, who died in an shootout with police, planted bombs at the marathon finish line, killing three people and injuring 264. Tsarnaev’s attorneys have argued, unsuccessfully, that their client can’t get a fair trial in the city where the bombings occurred. Jury selection took two months, and all 18 jurors selected are white. On the trial’s first day, defense attorneys acknowledged their client’s role in the bombings, but said he was heavily influenced by his older brother. Prosecutors, meanwhile, say messages scrawled on the inside of a boat where Tsarnaev hid after the attacks show he was motivated by anger over the U.S. government’s killing of Muslim civilians around the world. AMY GOODMAN: The trial comes as the the Council on American-Islamic Relations in Florida has announced it will sue the FBI for $30 million on behalf of the family of an unarmed Chechen man killed during questioning over his ties to the Tsarnaev brothers. The FBI says an agent shot Ibragim Todashev in self-defense after Todashev attacked him. But his parents have accused the FBI of killing their son in cold blood. For more, we go to Boston, Massachusetts, where we’re joined by Kade Crockford. She’s the director of the Technology for Liberty project at the ACLU of Massachusetts, where she’s been following the Tsarnaev trial closely. Kade, welcome to Democracy Now! Talk about the opening of the trial—very emotional, as people talk about their losses. KADE CROCKFORD: Yeah, really devastating testimony that we’ve heard so far this week in the trial, survivors describing their horrific wounds and the immediate impact of the blast, going from, you know, standing watching the race on a beautiful spring day to essentially waking up in a pile of carnage, finding body parts nearby, looking down at their own bodies and discovering missing limbs. It’s been really traumatic. And unfortunately, here in Boston, in a city where there is no death penalty—we, in Massachusetts, found the death penalty unconstitutional as a state in 1984; we haven’t executed anyone since 1947 in Massachusetts—are going through with this federal death penalty prosecution, which is highly unusual. And even the people of Boston who were victimized by this horrific attack, the majority of whom think that Dzhokhar Tsarnaev is guilty, oppose death for the defendant. It’s almost 60 percent of people polled say that they oppose the death penalty now. It appears as if, if the prosecution, if the DOJ at any point made an offer of life without parole without the possibility of appeal, that the defense team, headed by Judy Clarke, who’s an expert at getting people off of death row, would accept that plea. It’s not clear to us why the DOJ is going ahead with this death penalty prosecution, particularly given that the city is being retraumatized by this kind of testimony that we’ve heard this week. JUAN GONZÁLEZ: And, Kade Crockford, what about the judge’s pretrial rulings, how they affect the ability of the defense to mount their arguments in the case? KADE CROCKFORD: Sure. So, one of the most critical rulings that Judge O’Toole made this week barred the defense from discussing what are called mitigating circumstances. So, in that case, the defense’s main argument here, it appears, is to suggest that Tamerlan Tsarnaev, Dzhokhar’s older brother, was an overbearing, terrifying influence on the young man, whose parents had a few years prior moved back to Dagestan and left him, essentially, in the care of his older brother. Now, the judge has said that the defense essentially cannot address Tamerlan’s role in the guilt phase of the trial. As soon as Dzhokhar is found guilty, which is very likely, there will be a second phase of the trial, which is the sentencing phase. And in that portion, there will be more evidence, and the defense will likely be able to present much broader arguments about the elder brother’s influence on Tamerlan—I mean, sorry, on Dzhokhar. AMY GOODMAN: Can you now talk about what’s happening in Florida, this lawsuit that’s being brought by CAIR, and what—how that relates to the trial? KADE CROCKFORD: Sure. So, one of the main pieces of evidence that Judy Clarke and Miriam Conrad and the other federal public defenders, I think, probably want to be able to use in court to illustrate to the jury that Dzhokhar was terrified of his older brother is evidence from a 2011 gruesome triple murder that took place on the 10th anniversary of 9/11, actually, in a quiet Boston suburb called Waltham. In that murder, three people, one of whom was reportedly Tamerlan Tsarnaev’s best, closest friend, a man named Brendan Mess—three young men had their heads nearly decapitated in separate rooms of a house. There was marijuana dumped on their corpses and $5,000 cash left in the building. Those murders are still unsolved. Immediately after the murders took place, the DA, the district attorney for the area, told the press and the public that he suspected there were likely two people who were known to the victims who were in the house at the time of the murders. That was basically the last thing that the public heard substantively from the government about who was responsible for those murders, until after the Boston Marathon bombings. About a week after the bombings, ABC News published a report by Michele McPhee, a Boston-based reporter, containing anonymous law enforcement sources’ allegations that in fact Tamerlan Tsarnaev, the then newly deceased accused Boston bomber, was responsible for those murders. It was a bombshell. This news was huge in the Boston area. These murders that had been unsolved for nearly two years suddenly were pinned on a man who had—you know, was the most notorious figure in maybe the history of Boston, recently deceased. KADE CROCKFORD: —the FBI killed him, basically. The strange thing is that in the wake of those murders, even after saying that the FBI had forensic evidence linking Tamerlan to the crime scene in Waltham, in court last year the DOJ told the public defenders, in fact, we have no evidence linking Tamerlan to those crimes. AMY GOODMAN: Well, we’re going to have to leave it there, but we’ll continue to follow all of these cases. Kade Crockford is the director of Technology for Liberty project at the ACLU of Massachusetts. That does it for the broadcast. We have a job opening here, a part-time camera operator in New York City. Check out our website.